When the gawky 19 year-old Lewis met the suave singer Dean Martin in 1946, little did they know that they would become the most popular act in America for several years. Their box office draw was white-hot, so much so that neither of them could keep up with the blur of what happened to them. They eventually broke up at the height of their fame in 1956, during which Martin famously said, “Jer, when I look at you, all I see is a dollar sign.” The second phase of Lewis’s career would be about his prolific filmmaking, his ambassador role in the Muscular Dystrophy Association, the fog of his pharmaceutical addiction and his final years of character roles in films and the recognized standing as a revered comedy lion. He was born Joseph Levitch in Newark, New Jersey. His father – whose professional name was Danny Lewis – was a vaudeville entertainer, and his mother Rachel was a piano player. Young Joseph got the bug early, working with his parents in the Catskills (a famed Jewish resort) in New York starting at the age of five. He developed an act at the age of 15, where he would mime records with silly exaggerations, and took on his father’s professional name as Jerry Lewis. He was rejected for military service during World War II due to a heart murmur. In 1946, he was working his act in Atlantic City, at the famed 500 Club. Also on the bill was a handsome Italian singer named Dean Martin. The two knew each other, but it took the manager of the club, which were all associated with organized crime back in those days, to tell the two solo acts to get together, or he would fire the both of them. The duo went to the kitchen, and wrote their first routine on a piece of butcher paper. 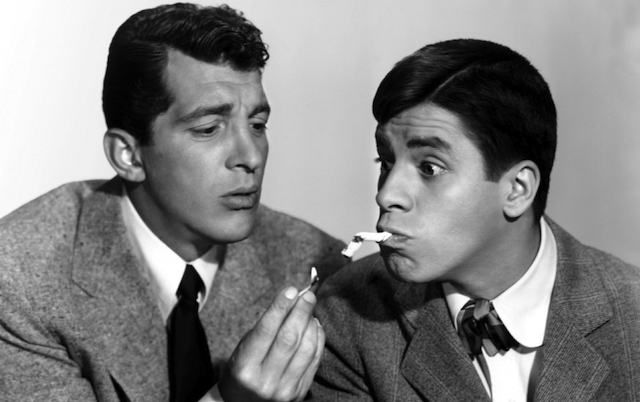 The basic act – Martin and Lewis – remained the same from that moment on to 1956, with Dean as the straight man and talented singer, and Jerry doing the extreme pratfall and rubber-faced comedy that would become his trademark. From their beginnings to their break up ten years later, it was as if show biz lightning struck the both of them. They made their national debut in 1948 on the Ed Sullivan Show, got their own hosting gig on NBC’s “The Colgate Comedy Hour” and made 16 films for Paramount Studios from 1949-56. The strain of that pace affected their relationship, to the point shortly before their break up where they only talked to each other through scripted lines in their last movie together (“Hollywood or Bust”). Lewis’s ten years after his break up with Martin – besides reestablishing his force as a comedian in Las Vegas – was characterized by his interest in being a filmmaking auteur and director, ala Charlie Chaplin. He made his directorial debut with the largely improvised classic, “The Bellboy,” and went on a hot streak at the box office which included “The Ladies Man” (1961), “The Nutty Professor” (1963, later remade by Eddie Murphy), “Three on a Couch” (1966) and “Which Way to the Front” (1967). He also wrote a much-read book about directing, “The Total Film-Maker,” and taught George Lucas and Steven Spielberg as a directing instructor at USC in the early 1970s. Besides his MDA telethon, Lewis had more success on television with Dean Martin than in his solo years. His 1963 show for ABC was a bust after 13 episodes. His one hour variety show on NBC in 1967 lasted two seasons, eventually losing its time slot to “The Mod Squad.” He was tapped for a syndicated talk show in 1984, replacing “Thicke of the Night,” but the try-out only lasted one week. 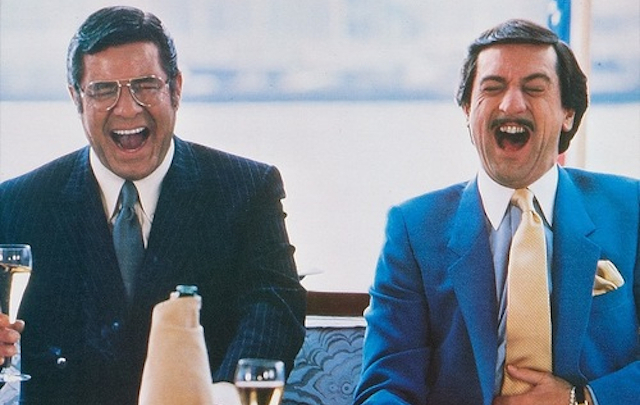 His later years after the 1960s were a balance between his image, which devolved into a drug-hazed parody of himself during the 1970s, and a certain desperation about his place in the show business firmament. He famously reunited with Dean Martin on the MDA Telethon in 1976, which was set up by Frank Sinatra (Martin and Lewis ended their relationship as friends. Jerry called Dean once a week after the singer was devastated by the death of his son in the late 1980s. Martin died in 1995, with Lewis coming in late to his funeral and sitting unnoticed in the back row.). Jerry Lewis was married twice, to Patti Palmer from 1944 through 1980, and SanDee Pitnick from 1983 until his death. He is survived by six children, including Gary Lewis, who had a noteworthy pop group in the 1960s (“Gary Lewis and the Playboys”). His youngest son by Patti, Joseph Lewis, died of a drug overdose in 2009. Lewis was plagued with health issues his entire life, including a noticeable weight gain in the late 1990s due to a treatment for pulmonary fibrosis. According to his publicist, he died at his home in Las Vegas after a short illness.